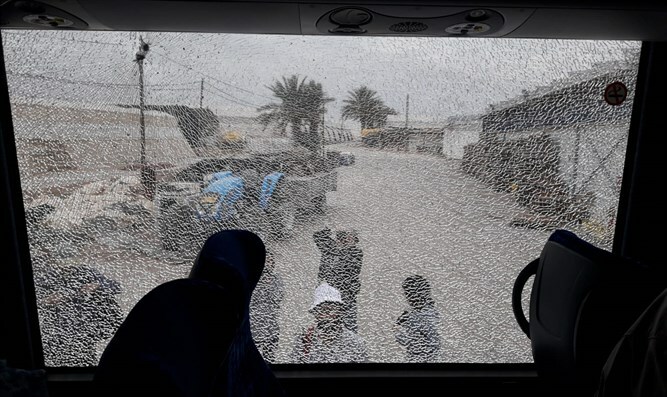 Dozens of foreign correspondents stationed in Israel were attacked Monday by Palestinians throwing stones on their bus, while on a tour organized by the Government Press Office. The attack took place in Jericho, where the journalists were visiting the town's ancient synagogue and other sites in commemoration of the 10th of Nissan, the day when Israelites crossed the Jordan river to enter the Land of Israel. There were no injuries in the attack. The bus, however, sustained damage as one of the windows was shattered. The tour was guarded and coordinated with the security forces, and the journalists were making their way from Jericho to cover the 10th of Nissan ceremony at the Jordan crossing site (Qasr el-Yahud). The location also holds great significance for Christians in Israel and abroad, believed to be the site where Jesus was baptized and visited yearly by thousands of pilgrims. Head of the GPO, Nitzan Chen, said: "The Government Press Office condemns the attack on members of the press who came to carry out their duty, The GPO provides wide coverage services to the foreign journalists, including diverse tours that introduce them to Israel's culture, legacy and innovation, along with the country's challenges. We will continue organizing these tours for the entire foreign press corps and will not be deterred by attempts to harm journalists"